After reading Steve’s latest article, I felt compelled to elaborate a little more and to show you guys what we’re currently working on to improve our results. I’m going to explain a current client we have, what issues came up, and our solutions to addressing what we found. The article I’m referring to is on the Functional Movement SYSTEMS. The FMS is more than just a movement screen. 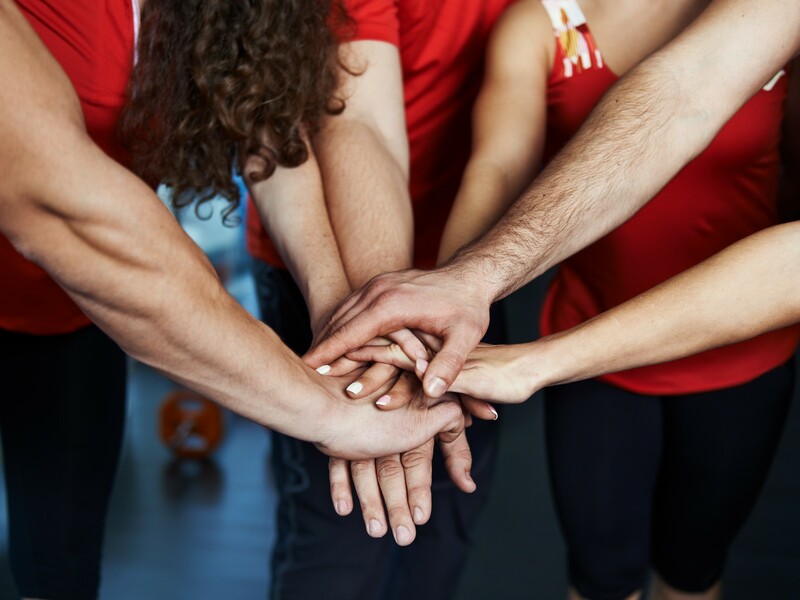 Their entire organization is based around creating “Standard Operating Procedures” designed to improve movement, both in terms of communication and practical application. They’ve done an amazing job at creating IF/THEN scenarios, creating flow charts telling you where to go, and creating solutions based upon individual findings. 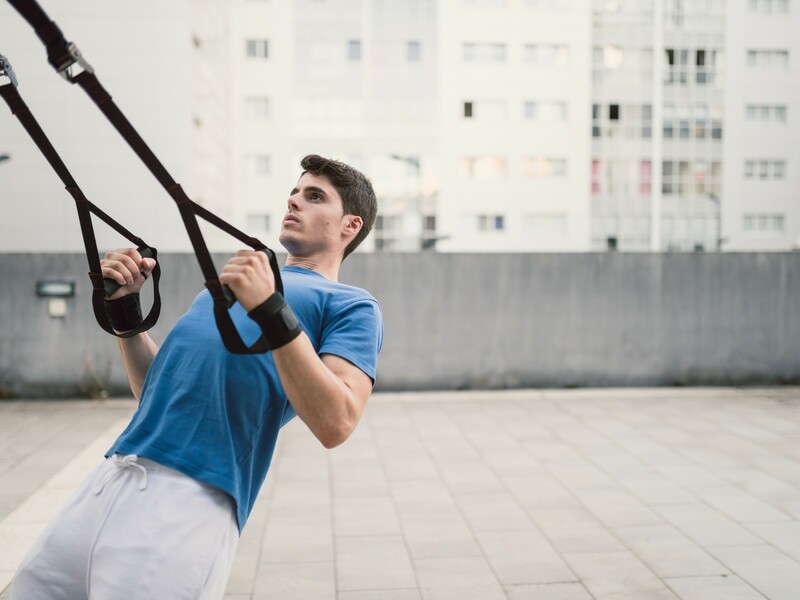 There are countless variables that come into play when you’re working with a human being, but the Functional Movement Systems have helped narrow down the process and give you WAY more information to work with. A skilled fitness professional, strength coach, or therapist is always going to get more out of the system. However, since we’ve got systems in place, our younger and more experienced coaches can now replicate what the skilled professional is doing…to a certain extent. Essentially, using these systems will help narrow the gap between the best-of-the-best. We’re still learning a ton on a daily basis, and using these systems within our business has proven to be our most valuable asset. Teaching these systems to our trainers has allowed us to get amazing results without having to do all the work ourselves. Let me show you an example of how we used the Functional Movement SYSTEM (combination of FMS and Y Balance) to work with one of our clients recently. Here’s a quick recap of what’s going on with Toni. One of our clients, Toni, recently complained of mild, acute back pain. Occasionally her low back would hurt after a long day on her feet, lack of activity, and sometimes from her workout. She really couldn’t pinpoint anything that was directly related to her low back pain, so our first action step is to set up a movement screen to see what’s going on. This not only allows us to look at her movement patterns, but it’s also a great session to set aside some time to talk to her about what’s going on in her life and get lifestyle issues that may be relating to the pain. Win/Win. So that’s what we did…we set up the initial session and started screening. After taking Toni through the initial FMS, we found her only red light or dysfunctional pattern to be the push up. She’s had this issue for awhile now, but she also used to have a rotary stability dysfunction but recently cleared the pattern. After taking her through the screen, I still wasn’t convinced she had adequate stability. We already found out that her Trunk Stability Push Up was dysfunctional, but I wanted to find out more. So, I decided to run a couple quick breakouts and a Y-Balance Test with her. I am definitely no expert with the Y-Balance Test yet, but I’m getting some interesting information and seeing a ton of value. As Steve said in his previous article, The Functional Movement Screen has a bias towards mobility. Stability is addressed, but mobility and basic motor control are the main drivers behind the screen. Adding the Y-Balance Test to the equation allows the Functional Movement Systems to exploit both areas…Mobility with the FMS and stability with the Y-Balance Test. In my short experience with the Y-Balance Test, I can see a ton of value moving forward. 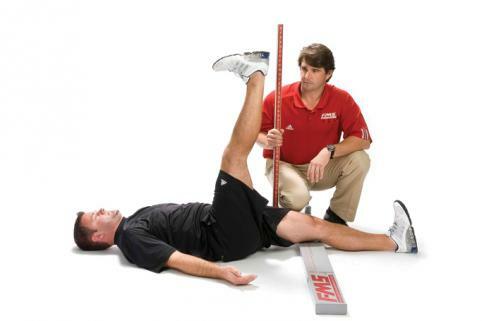 The Y-Balance Test allows us to narrow down stability or motor control issues to a specific quadrant or quadrants. 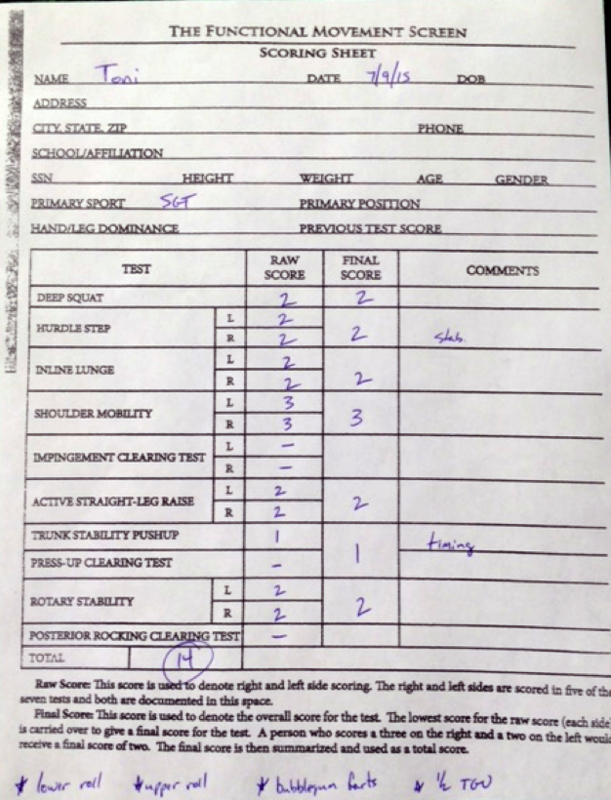 Just like the Functional Movement Screen, there are certain criteria that must be met. If you find a dysfunction, simply mark it and move on. After doing the test with Toni, we found two specific quadrants to be of concern. Her upper left quadrant and her lower left quadrant. Basically, her left side didn’t function like the right. There was a pretty obvious asymmetry, and the Y-Balance Test exploited that. Lower Rolling (left side only) – This was one of the breakout screens we did prior to the Y-Balance Test. We found an asymmetry here on both upper and lower rolls to the left. The Y-Balance Test confirmed the rolling breakout. The only other thing I’d like to note with Toni was how it affected her program. You can see the correctives we did with her, but her programming was also affected slightly as well. Since she’s a group client, we went through the group program we’re currently in and made some minor changes. I had her eliminate most, if not all, bilateral work and started to exploit that asymmetry with her program. 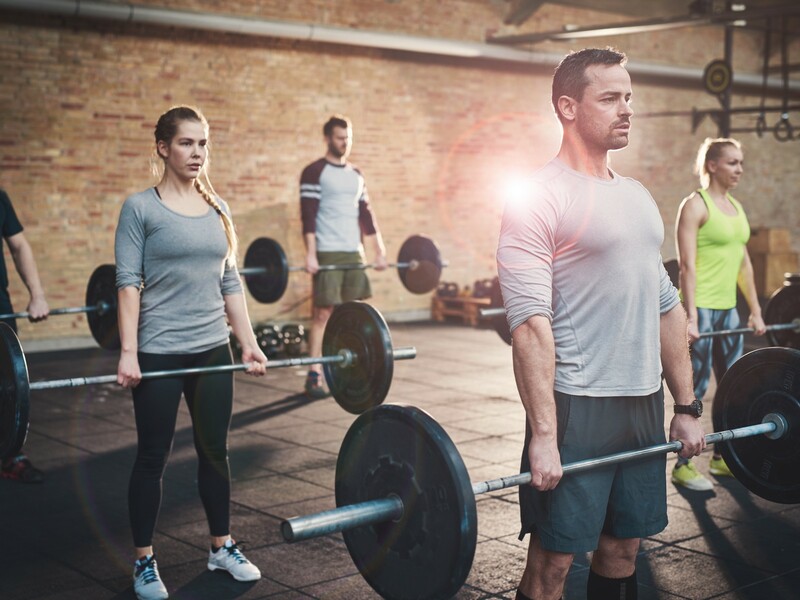 For example, one of the programmed exercises was a progression of Goblet Squats or KB Front Squat, a bilateral squatting exercise. All I did with her was switch it from doing the KB Goblet or Front Squat to an Offset Front Squat, doing more on that left side we found to be dysfunctional. All in all, I think that was a solid hour spent with one of our clients. I was able to find a major asymmetry, dial in her corrective strategy, and make minor changes to her program to help her improve. I’ll re-screen her within a few weeks and see what happens. That’s the kind of SYSTEM I’m talking about. 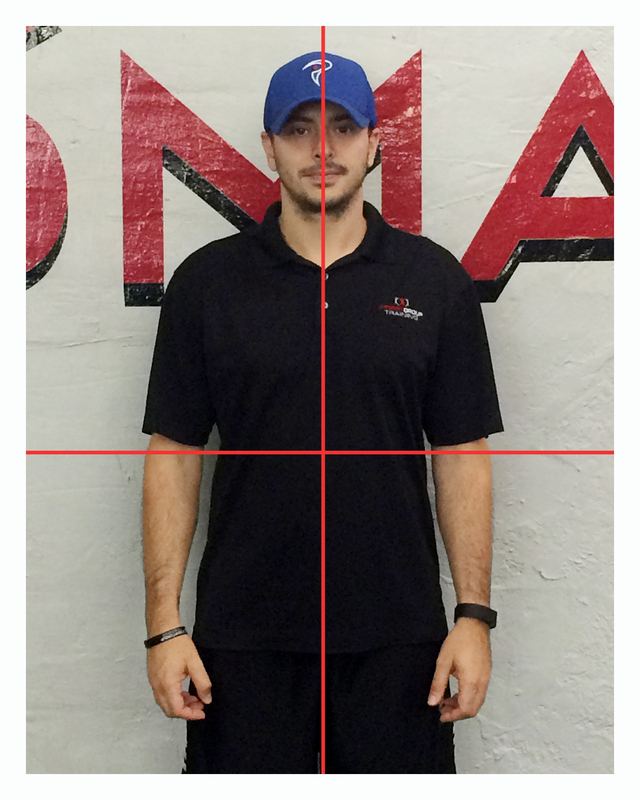 The Functional Movement Systems have helped us dial in our programming and getting better results with our clients. We’ve taken what works for us in our gym, created a system around it, and made a process easy to follow with our coaches and trainers. Smart Group Training: The System will help you learn how to use a system like this within your gym. If you want more information and want help dialing in your programming like that, check out SGT: The System today! P.S. – SGT: The System just launched this week and is currently on sale. Pick up a copy before midnight Friday, August 14th and you’ll be able to save $100.